I've been a Tournament Director now for about 5 years and some of the rulings you have to make can be quite horrible. One thing about running tournaments is you are always kept busy, whether it's moving people to tables from a broken table or doing rulings. One big tournament I was running had 158 runners so, imagine myself and 3 chip runners, running about like headless chickens and you'll be not far off feeling what we're going through. At the end of the rebuys and with about 500k chips in play, the good news was that about 4 of the tables had huge chip monster leaders. After 6 hours play with my 30min blind structure we're down to the last 18 players. 16 players get paid, so 2 people to go and they're all in the money. Players always get more twitchy when they're close to the money as they are noticing if they are short stack and need to do more work, or looking at the other tables to see how everybody else is doing. So, you have to watch over tables to make sure that play is moving at the same speed. If one player goes all in for 40k, another player thinks for too long and I end up putting a clock on him, by this time the other table has ground to a halt and they're watching my table so I have to get their game back on track. Eventually the other guy calls and says: "You must be ahead" Player 1 had AK, player 2 had 7,7. Player 2 also had 20k chips more so would still be in but would have been down to the felt which is why it was such a big decision for him. Flop: A 2 Q, Turn 6, and River 7 Ouch! Player 1 goes out. 5 mins later, it's ruling time on the other table with 9 players on it. They had just been dealt their cards. 1 player is all in, player 2 calls the all in with chips to spare. Player 3 reraises all in. Player 1 has then noticed that player 2 has three cards! The top card was stuck to the bottom two cards. So, before a squabble takes place, I zoom into action. As the onus is on the player to make sure that they have two cards, player 2's cards are dead but the chips stay in the pot. Player 3 takes back the re-raise part. Player 1 had AA, player 2 had 9,9 and with hands now dead he showed the table his cards. Player 3 had AK spades. Sometimes poker is a very cruel game. The flop came A Q 10, with Q and 10 being spades giving player 3 a royal flush draw and player 1 trip aces. The turn card was 8 of hearts and river 4 of spades so player 3 took a huge pot and rivered the flush. 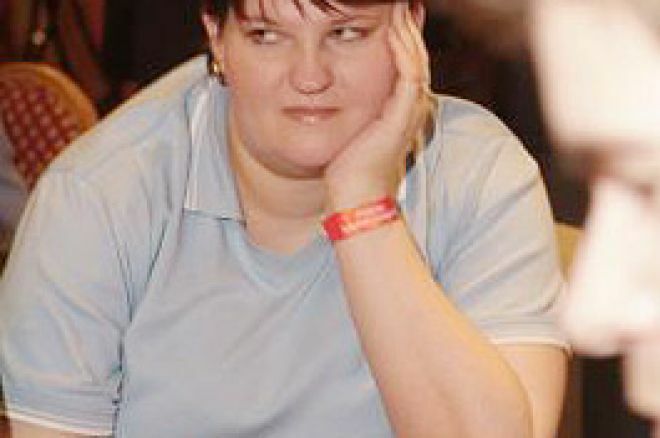 Mel Lofthouse has is available as a Tournament Director at any UK venue. Ed note: Download 24h Poker for a &euro;200 deposit bonus. Don't worry though, you don't have to play for 24 hours to claim the bonus.